Early European settlers of the region that was to become the outer western suburbs of Sydney, in the first decade of the 19th century, were informed by Aborigines that, what is today called the ‘Sydney Basin’, was in the long-ago “Dreamtime” largely under water, and that many tall hills of the district were then islands and that what are today the Hawkesbury, Nepean and Georges Rivers did not exist. Similarly, Aborigines of the Burragorang Valley [south of Katoomba and the adjoining Jamieson Valley], believed much of the valley had once been flooded. One Aboriginal account of the “Great Flood”, which came from the Campbelltown district, south-west of Sydney, relates that the great water [ie ocean] to the east once rose to cover the land.. 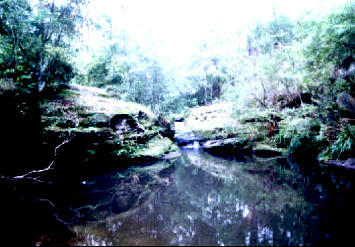 In 2002 leading Gilroy field assistant Greg Foster uncovered a Nim Sun-Worshiop temple site incorporating a sacred pool fed by a creek, in a secluded scrub-covered gully in Sydney's north-west. Note the eyes, nose and mouth of the large rock at the water's edge on the right, depicting the face of Nim . Photo © Rex Gilroy 2004. One Aboriginal account of the “Great Flood”, which came from the Campbelltown district, south-west of Sydney, relates that the great water [ie ocean] to the east once rose to cover the land. As the countryside was submerged the tribespeople sought refuge upon the tallest hills until the water receded. Similarly, Aborigines of the Nepean/Hawkesbury district found shelter on the nearby Blue Mountains until their lands re-emerged from the waters. These legends date back to the late Pleistocene period [Ice-Age], when the melting ice caps caused world-wide flooding [see Chapter One]. Eventually the Sydney Basin began to re-appear as the waters receded, in a process which must have taken many centuries. Later Aboriginal tales spoke of large areas of lake and swampland, river and creek systems now long vanished, which were fed by the Georges, Hawkesbury and Nepean Rivers, which today enclose much of the Sydney Basin region. These ancient waterways finally dried up by several thousand years ago, through a shift in the water table of the major rivers, partly due to a gradual geological uplift along the eastern Australian coast. Prior to this great dry-up, a number of extensive swamplands and lakes still existed in what are now the outer western suburbs, near Parramatta, westwards into the Richmond/Penrith districts; and until early in the 20th century, the last vestiges of one such lake still existed between Prospect Hill and Smithfield on the northern outskirts of Fairfield, around the eastern fringe of which once flowed an arm of prospect creek to feed this lake. Prospect Creek is still a wide, deep waterway that enters the Georges River near Bankstown, this river in turn flowing westward to turn south at Liverpool on its way to Campbelltown and beyond. Just north of Liverpool the now reed-choked Cabramatta Creek enters the Georges River. There is evidence that, in ancient times this creek was wider and deeper than now, winding south of Cabramatta westward, then south through Mt Pritchard to re-join the Georges River south of Liverpool, creating an island out of the present site of Liverpool city. Upon these ancient watercourses Aborigines once sailed their rafts and canoes, which they shared, they once said, with “culture-heroes”. These “culture-heroes” were the Uru. During the mid-1920s, my grandparents, Albert and Alice Perkins, purchased a bush-covered 11acre property at Lansvale, wedged between Prospect Creek and the Georges River, in what is today an over-developed part of Sydney’s western suburbs. When not at his Cabramatta Estate Agency, ‘Pa’ worked on his property, which would later become my parent’s home, and where I grew up throughout the 1940s and 50s. Information passed down to me is sketchy, but it appears Pa unearthed, on numerous occasions, small river pebbles [alien to this district] beautifully engraved with the figures of snakes, birds and other strange motifs of a quality unknown to the former local Aborigines. Unfortunately Pa, a businessman, had no interest in such things, and the relics were eventually discarded or given away. In the years that followed similar finds were made by people over a wide area of the Georges River, Prospect Creek, Villawood, Canley Vale, Cabramatta and Liverpool areas, often adjacent to some long dried-up ancient watercourse. University anthropologists who saw some of the engraved pebbles automatically labelled them ‘Aboriginal’, even though they appeared too finely crafted to be so. During the 1950s I can still recall that a great many ancient creeks still covered this entire region, their former courses snaking their way through and around the widely scattered suburbs for many kilometres. The only times these ‘dead’ creeks ever flowed with water was in excessively heavy rainfalls and bad floods. The outline of one of these creeks, an offshoot of the Prospect Creek, branched off just south of Carramar [on the southern outskirts of Fairfield] and not far from the historic, convict built [sandstone] Lansdowne Bridge, to cut across country for a couple of kilometres through our property, before turning east to re-join Prospect Creek south of the bridge. This offshoot had once been very wide and deep, creating an island out of the land on its eastern side. It was on the edge of this former island, one day in 1955, that fragments of primitive stone-age period clay pottery, including an almost intact bowl, were dug up by a resident opposite our property. Aborigines did not manufacture clay pottery even of the crudest type; who, then other than an Uruan might have produced this pottery? Other engraved pebbles, and also larger stones bearing strange script and symbols were dug up on “Lansvale Island” by locals but usually discarded. Crude stonework, the remains of apparent ancient human structures, were also unearthed during the construction of a house. Found at a depth of about 2 metres, these stones were thoughtlessly discarded in nearby Prospect Creek. Interestingly, early European settlers first learnt the name “bou-mar-ang” from the Turawul Aboriginal tribe of the Georges River district. The name in fact, applied to the returning boomerang, which was used in western and eastern Australia and nowhere else. The Turawul people said their ancestors had obtained the returning boomerang and other cultural items from the “culture-heroes” and it was these “culture heroes” who gave them many of their religious beliefs and practices in the long-ago “Dreamtime”. Descriptions of these great culture-bringers elsewhere describe them as a white, ie pale-skinned race. The rivers worldwide were highways to ancient seafaring peoples, and the white-skinned Uru would have sailed upon Australia’s river systems, penetrating our continent’s interior. They would have been familiar with every river of the Sydney district, using their canoes and rafts to navigate the myriad of offshoot creeks that once penetrated every corner of western Sydney, trading with one another or with Aborigines. Such river and creek journeys kept the many Uruan settlements in contact with one another. 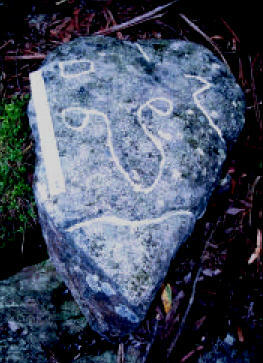 Overlooking the gully temple site, Greg also discovered this engraved head bearing Uruan glyphs reading "Temple of Nim".